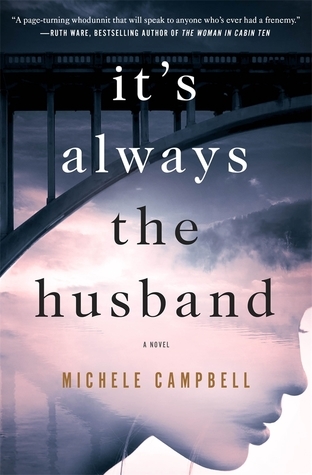 Today I'm featuring my current recent read, It's Always the Husband by Michele Campbell. The excerpts shared are from the hardcover (borrowed from the library). Page 56: "She was half tempted to do something crazy, just to show them, to get them off her back once and for all." My thoughts: The lives of three young women from very different backgrounds intertwine in unexpected and fateful ways in this captivating read. From Goodreads: Kate, Aubrey, and Jenny. They first met as college roommates and soon became inseparable, even though they are as different as three women can be. Twenty years later, one of them is standing at the edge of a bridge . . and someone else is urging her to jump.